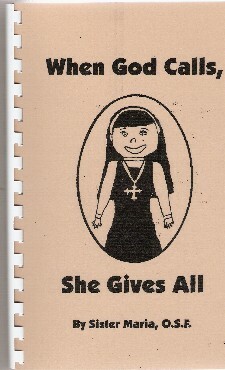 Sister Maria's book explains religious life to both children and adults. It is written in a vocabulary which children can understand but provides information about the beautiful life of a sister that is interesting and important for all ages to know and learn. The first chapters of the book explain the many aspects of the life of a sister: community life, prayer, the vows, simplicity, the process of becoming a sister. The chapters on the apostolate explain the apostolate of the Missionaries of the Liturgy and the final chapters explain how a person can be open to the vocation God is calling him or her to. 90 pp.